in AUD to USD, USD to AUD, USD to NZD. 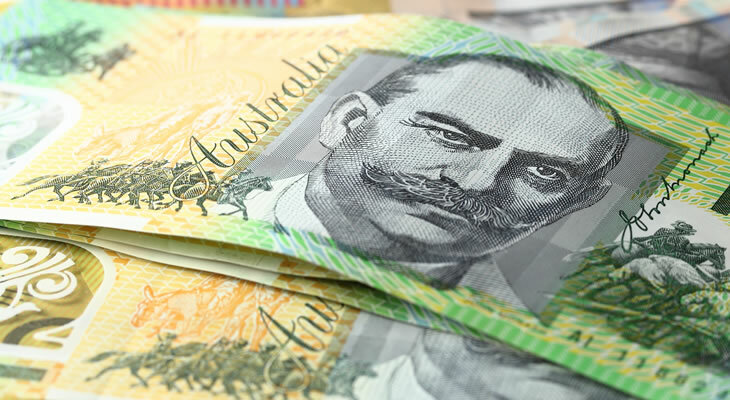 The US Dollar (USD) has been trending against the Australian Dollar (AUD) in a narrow range today after an unexpected iron ore demand saw the ‘Aussie’ regain lost ground against its rivals. The bullish rise in iron ore demand has been unexpected, and has seen the ‘Aussie’ gain against the Canadian Dollar (AUD/CAD) and the New Zealand Dollar (AUD/NZD) by 0.2% and 0.4% respectively. Although this demand has bolstered the Australian economy, demand for gold remains far lower than is ideal, and a gain for one of Australia’s key exports has not entirely balanced a loss for another; the Australian Dollar has been trending in a narrow range against the US Dollar (AUD/USD) today. The New Zealand Dollar (NZD) has experienced significant declines today of over -0.4% against the Australian Dollar (NZD/AUD), the Pound Sterling (NZD/GBP) and the US Dollar NZD/USD); these drops come after news of New Zealand’s agreement to the Trans-Pacific Partnership (TPP) may be secured over the weekend. Although the deal would bring an overall 2% increase per year to New Zealand’s economy, the current terms are still highly unfavourable to the prices of ‘Kiwi’ dairy exports, a fact that has hindered the country agreeing to the deal, and reduced the New Zealand Dollar’s performance. The US Dollar to Australian Dollar (USD/AUD) exchange rate has risen significantly today, a reverse of yesterday’s decline for the ‘Greenback’ against the commodity currencies (AUD, NZD, ZAR). The US Dollar (USD) has risen by 0.2% against the South African Rand (USD/ZAR) today, and posted a greater gain of 0.4% against the Australian Dollar (USD/AUD). Commodity currencies rallied yesterday after the Chinese government moved to stabilise the Chinese stock market, but today’s decline could signify a slide in confidence over the prices of Australian and South African mining exports, as well as a general lack of certainty over the stability of the Chinese stock market. The US Dollar’s gains today are likely due to the imminent Federal Open Market Committee (FOMC) meeting, which will provide guidance on the Fed’s interest rate outlook. The New Zealand Dollar has reversed its position from yesterday, seeing a decline of over 0.3% against the Pound Sterling (NZD/GBP), the Chinese Yuan (NZD/CNY) and the US Dollar (NZD/USD). This reversal of fortunes could reflect a more pessimistic prediction for the content of Reserve Bank of New Zealand (RBNZ) Governor Graeme Wheeler’s impending speech. The US Dollar (USD) has softened against its competitors today, seeing the most significant losses against commodity currencies such as the Australian Dollar (USD/AUD) and the South African Rand (USD/ZAR). The US Dollar has fallen by -0.6% against the Australian Dollar (USD/AUD) and the South African Rand (USD/ZAR) today, as news comes that Beijing will work to stabilise the Chinese stock market by buying stocks and shares to strengthen the volatile market. This has had a positive effect on the ‘Aussie’ and the Rand as a stable Chinese economy could lead to more growth and, by extension, higher demand for the mining ores and minerals that Australia and South Africa produce for international export. The New Zealand Dollar (NZD) has also rallied today ahead of Reserve Bank of New Zealand (RBNZ) Governor Graeme Wheeler’s imminent (and crucial) speech on the nation’s economy. Opinions on the speech appear to be highly optimistic, as the ‘Kiwi’ has risen today by over 0.8% against the Chinese Yuan (NZD/CNY), the Euro (NZD/EUR) and the US Dollar (NZD/USD). The ‘Kiwi’ has also gained against the Canadian Dollar (NZD/CAD) and the Pound Sterling (NZD/GBP) by 0.5%. The Australian Dollar (AUD) has risen by 0.7% against the US Dollar (AUD/USD) today, despite the US reporting an increase of 3.4% for Durable Goods Orders in June and a 0.8% increase in Durable Goods Orders Excluding Transportation. The ‘Aussie’ has also risen by over 0.4% against the Chinese Yuan (AUD/CNY), the Euro (AUD/EUR) and the Pound Sterling (AUD/GBP). These figures, particularly those in the AUD/USD exchange rate, show a great deal of optimism for the future price of Australian commodities, and the value of the Australian Dollar. The US Dollar to Australian Dollar (USD/AUD) exchange rate is currently falling, but significant meetings and data releases over the coming week may reverse the current trends seen by the ‘Aussie’. The forecasts for the American July Services PMI, June Pending Homes Sales, and Q2 GDP are all favourable towards the ‘Greenback’ and if the Federal Open Market Committee (FOMC) meeting results in an interest rate decision being brought forward to September, it seems probable that the US Dollar will rise against the Australian Dollar (and other commodity currencies), in spite of the less dire news from China. Of course, if the results happen to be lower than expected, the ‘Greenback’ may continue its current downtrend, for the next week at least. The US Dollar to Australian Dollar (USD/AUD) exchange rate was trending in the region of 1.3658, the Australian Dollar to US Dollar (AUD/USD) exchange rate was trending in the region of 0.7323 today, the Australian Dollar to New Zealand Dollar (AUD/NZD) exchange rate was trending in the region of 1.0966, the New Zealand Dollar to Australian Dollar (NZD/AUD) exchange rate was trending in the region of 0.9123, and the New Zealand Dollar to US Dollar (NZD/USD) exchange rate was trending in the region of 0.6678 today.